Join Cacapon Institute on September 10 for a fun paddle trip! Cacapon Institute’s 2nd Annual Potomac River Paddle Trip Come spend the day with Cacapon Institute as we paddle the Potomac River from Great Cacapon, WV to Hancock, MD. This is a free event. Cacapon Institute will be renting canoes for those who do not have one, but there is a limited supply. CI will also be furnishing a catered lunch. Please register below and let us know what you need. 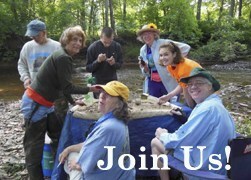 Cacapon Institute is able to make this possible because of the generosity of our members and supporters. If you would like to support this event and CI, please consider a tax-deductible $50 donation. Donations of any size can be made by clicking here or by visiting our webpage and clicking on the link on the right. Saturday, September 10, 2016 from 9:00 a.m. – 4:00 p.m. Arrival Time: 9:00 a.m.Paddle Trip Details: The paddle is a gentle ~10 mile journey on the Potomac River from Great Cacapon, WV, to Hancock, MD. Beginner paddlers are welcome! This paddle is free and open to the public (donations suggested). We will be in touch as plans develop regarding boat rentals. 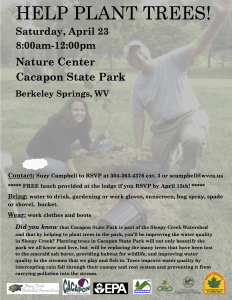 Click on this link: Cacapon Institute for more information and to register at the Cacapon Institute site. 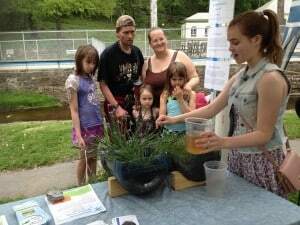 The League of Women Voters of Jefferson County and other local nonprofits, West Virginia Rivers Coalition (WVRC), water utilities, and state and local agencies will host a free public forum on how residents can get involved in drinking water protection, May 12, from 6:30–8:30pm, at the Clarion Hotel in Shepherdstown. The event focuses on how Jefferson County residents and businesses can help shape “source water protection plans.” A law passed after the 2014 water crisis in Charleston requires most public water systems to submit a source water protection plan by July 1, 2016. Shepherdstown, Harpers Ferry, Charles Town, and some of the County’s community systems are preparing plans now. The law also requires water utilities to involve the public in crafting the plans. The May 12 event in Shepherdstown is the one of four regional forums WVRC has organized to facilitate public participation. At the forum, county residents will learn about what goes into the plans and how to provide input on the plans. They will also learn how everyone can help utilities identify potential threats to drinking water. Organizers stress that the forum is not a venue to voice complaints about water service and water bills. It’s an event to learn about water supply—before it enters an intake. 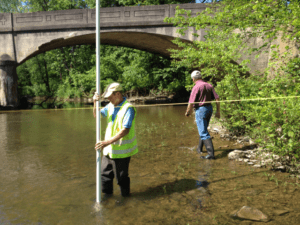 “The League of Women voters is excited to be a local host for this important process to ensure the public knows more about its drinking water supplies,” said Mary Sell, president of the Jefferson County league chapter. 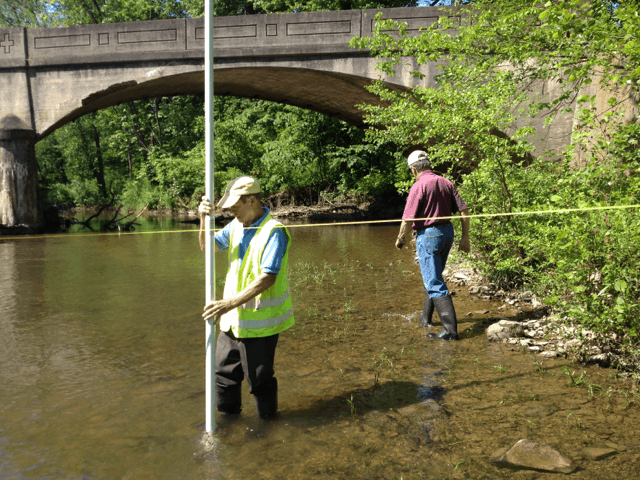 Utilities working on protection plans are identifying potential sources of contamination for each utility’s “zone of critical concern,” the area alongside the stream in which the intake is located, as well as the stream’s tributaries, from which water flows downstream to the intake within five hours. Although the Charleston-area crisis was sparked by a leaking chemical storage tank, some of the largest threats to drinking water come from other sources. The WV Bureau for Public Health has said that railroad lines and highways pose the highest threats for sources of contamination. The plans also require each utility to have a communications plan to reach customers quickly in the event of an emergency. The forum features exhibits by local water utilities, agencies that work on water, and nonprofit organizations. The evening also includes “Drinking Water Jeopardy,” an interactive game based on the popular game show. A free booklet on how to be involved in drinking water protection will be given to event attendees. Jefferson County public health officer Dr. David Didden will welcome participants to the forum, and each utility and the contractors working on their plans will answer questions. The event is free; refreshments will be provided. Tree planting season is underway! 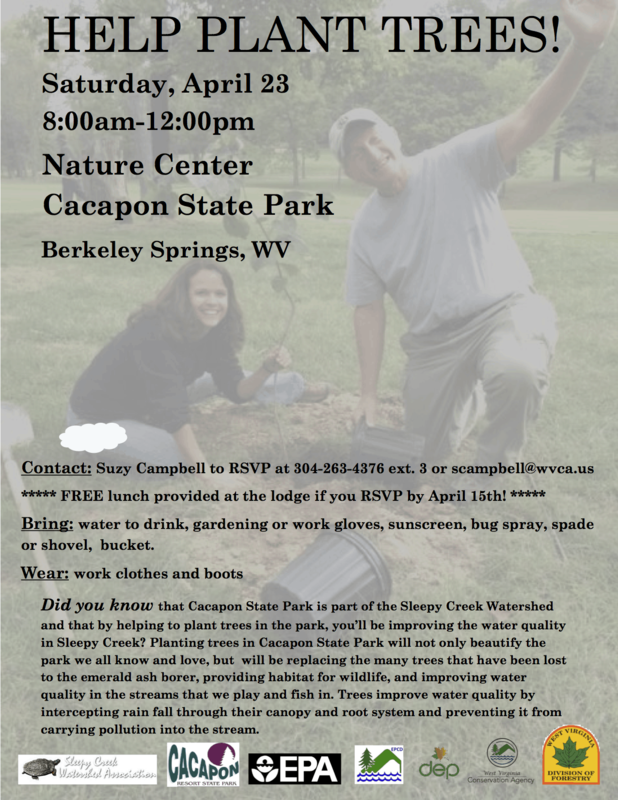 Come join us for a fun tree planting event!